Electrical cables shown here, have similarity to axonal tracts. The best way to visualize axonal tracts is to start with a simple electrical cord. 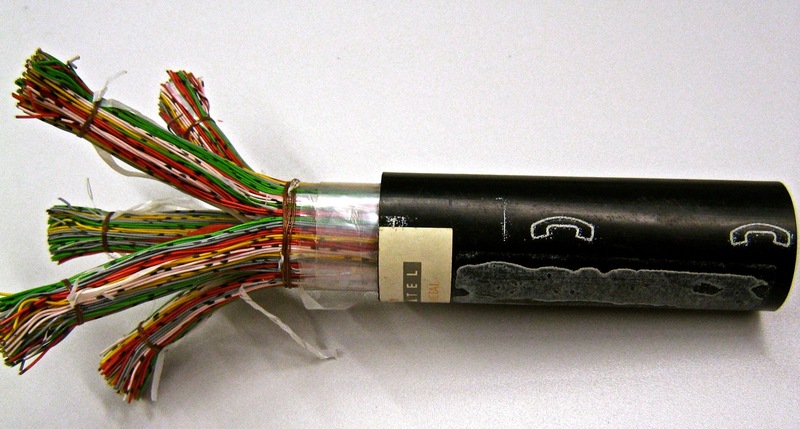 It has a series of small copper wires, bunched together inside a layer of insulation. The individual strands would be analogous to individual axons. The distinction between what is shown on the right and what an axon has is that the myelin sheath independently insulates each axon, it does not cover groups of wires as shown. Now to conceptualize an axonal tract (as opposed to an axon) compare the above drawing to the picture of below. Below is a picture of a telephone cable that would be servicing the telephone needs of a large office. You can still see the individual wires, but they are relatively small compared to the scale of the cables themselves. Larger telephone cables are like axonal tracts. Likewise, axonal tracts are groups of axons running together on such a scale that they can be seen by the naked eye. Compare the above image to an actual photograph of axonal tracts within an autopsied human brain, below. The visible to the naked eye axonal tracts run from the outside of the brain into the inner brain. 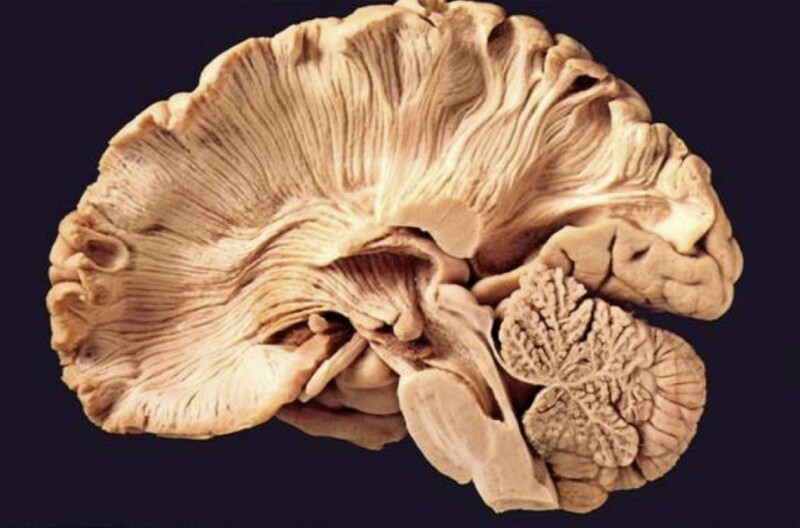 This picture was made by removing all of the brain matter, except the axonal tracts. There are two major reasons why we have taken the time to explain axonal tracts. First, this photograph demonstrates the way in which axons (contained within the tracts) run from the outer portion of the brain, through the white matter into the inner brain structures and the spinal cord. Second, while axons cannot be imaged on an MRI or CT, because they are too small, axonal tracts can be. The MRI technique called Diffusion Tensor Imaging, which we will discuss later on, can see pathology that impacts the axonal tracts.